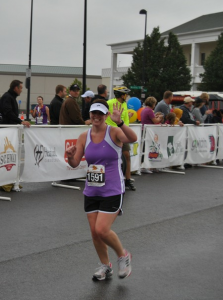 Last year when I decided to sign up for my first half marathon training, everyone, including ME, thought I was crazy. Growing up I wasn’t athletic. I tried dancing but looked like a baby deer learning to walk. Softball? Nope, too many balls flying at my face. Basketball? Uh-uh, I never knew where to go, and what to do. So I stuck with reading books, and let my siblings shine in the athletic department. A good friend of mine, who is an avid runner, convinced me I could run a half marathon. So I sucked it up and signed up for a 12 week half marathon training program with a local running group. That first run was scary, and hard, and did I mention scary? But I stuck with it. I ran every morning during the week with a group of women and then met up with the training group every Saturday for our long runs. Before I knew it, October arrived and it was time to run the Prairie Fire Half Marathon. I ran that half marathon and it wasn’t easy the entire time, it wasn’t fun the entire time, but crossing that finish line with my running friends, my family, and hundreds of other people clapping and cheering? THAT was fun, that was amazing, that was euphoric!! Now? I run as often as I can, I have done a 2nd half marathon and in less than a month I will start my 3rd training program to run the Prairie Fire again in the fall. Why do I run? Running doesn’t discriminate. You don’t have to be skinny, or fast, or coordinated. You just have to get out there and do it! I do it so I can spend time with my running group, who is now like a family to me. I do it because I feel healthier and stronger after each run. I do it because it makes me a better mother, wife and colleague. But most of all I do it because I never thought I could. I was always my biggest critic, telling myself I wouldn’t do it, that I would quit like I quit every other sport I tried. Now here I am, getting ready to embark on my 3rd half marathon training. I am a runner, I am an athlete, and I am strong. To anyone who thinks they can’t do this, you can. Regardless of age, body type, or athletic ability. It’s all mental and if you want it bad enough, you will do it. I did and I can’t wait to do it again.